Private property has been severely restricted on the Communist-run island since 1959. The changes are part of a shake-up of Cuba's struggling economy. Yeah, I can buy it, but with what? But the Communist Party newspaper, Granma, said the Council of Ministers approved new regulations on Wednesday that "eliminate existing mechanisms of approval for the purchase of motor vehicles from the state". "Yeah, I can buy it, but with what? 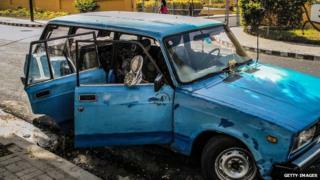 Unfortunately our economy doesn't allow us to save money to be able to buy it," the news agency quoted Havana resident Jorge Canso as saying.